Recently I had the honor of being selected as a tester for Peek-a-Boo pattern shop. I love the creative process, and was excited to get my feet wet in the tester department! I tested the Evelyn Dress and Tunic (Click here to view more details) - a pattern Amy has had out for quite some time - but she was making some revisions AND extending the size range! Yippee!!! This was a pretty quick sew - I forgot to time myself (and my sewing time tends to be broken up thanks to the two munchkins who like to "help"). But I'd say around an hour. I was asked to test the size 5 in tunic length - and I chose to do the ruffled / gathered accent and bias tape hem. The pattern was pretty clear throughout - lots of photos. During the testing process I had a few questions about which way to press things, etc. - and suggestions for seam finishing and top-stitching reminders and I'm excited to share that those things have been made even more clear in the final pattern - YAY! I LOVE the back detail. The little keyhole and ties are just too adorable! This is such a simple, yet fun and funky, little pattern. My little model wore her tunic with a pair of jeggings and boots and it looked adorable - but it will also be great for spring / summer with shorts! 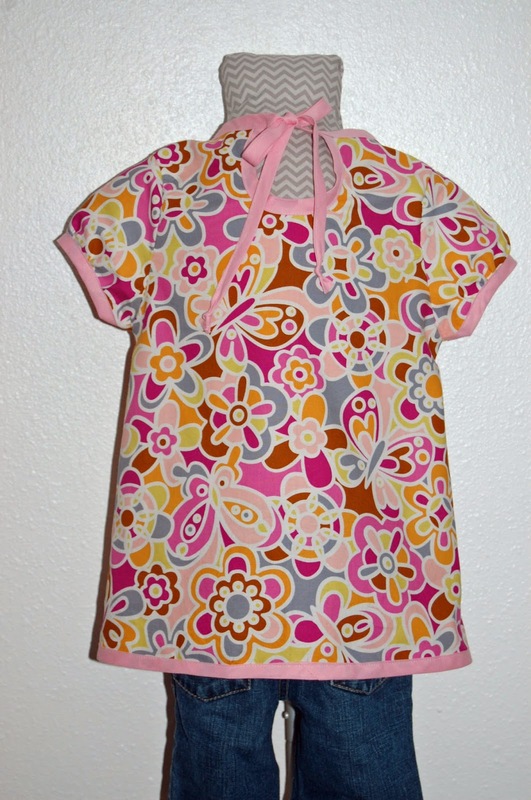 Depending on your fabric / finish / style choices, this one could be made to have a very retro look - or a super sweet, simple top. A few of the testers even added embellishements like lace to it - so much fun. The fit is GREAT. My little model wears a size 4/5 in ready-to-wear clothes and her mom says she's at that tough stage where lots of things fit funky. This tunic was a perfect fit. It has enough room to be able to play / move around - but the shoulders fit perfectly, the length was spot-on, and the fact it has the keyhole / ties in the back make it an easy-on and off piece of clothing. 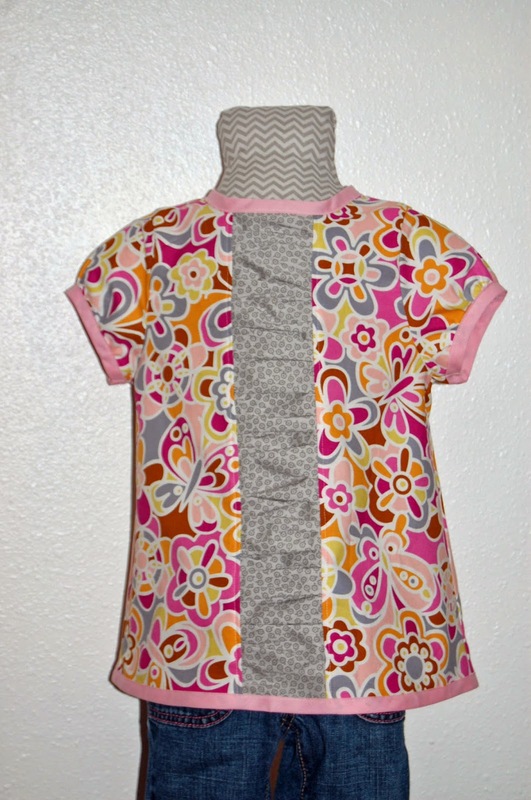 I can't wait to sew up some more of these adorable tunics / dresses - and you shouldn't either! Right now, this pattern is on sale for $6.95 to celebrate its re-launch! Get it here! Yippee! Disclosure: In exchange for being a tester (and sewing / providing feedback directly to the designer), I was given the pattern to test for free. I was not compensated in any other way. The opinions above are mine alone - and are not influenced by the fact I got the pattern for free (I'd LOVE it even if I had paid for it!) :) This post contains a few affiliate links. Buying from Peek-a-boo patterns using these links helps make a little money for me - to allow me to continue to pursue my creative adventure. Thank you!! !